Meet Ida, the 47 million year old fossil who may represent one of our earliest known ancestors. She's probably the most complete primate fossil ever discovered, and she explains where humans (and lemurs) come from. Hailing from the Middle Eocene (about 47 million years ago), this discovery will help to shed light on the early history of a potential human ancestor. Discovered in the late 1980s, the specimen was divided into two separate parts and sold to different buyers, and wasn't reassembled until 2007. This new species, now called Darwinius masillae, is named for Charles Darwin, and is believed to exist very close to an evolutionary branch that would eventually lead to modern primates and humans. 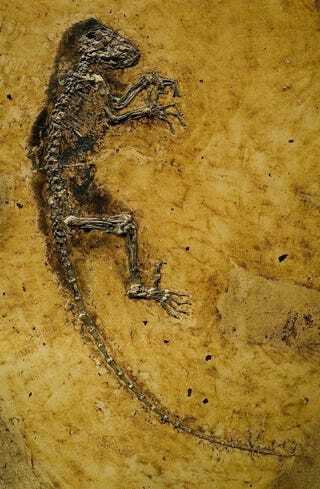 This specimen in particular is a young female, named Ida, and is so highly preserved that soft tissues and fur impressions were preserved, along with the digestive tract that allowed researchers to discover the last meal that it ingested - fruits and leaves. She also had a broken wrist, which had since healed, and it is believed that she would have been about 9 months old. Alive, she would have weighed around two pounds, and about two feet in length. This finding is a remarkable one, not only for the high preservation of the fossil, but for the potential implications for paleontologists. A mere twenty million years prior to this is the KT boundary, a major extinction line that saw the demise of the Dinosaurs. With their passing came the rise of the mammals, and a world that looked much like ours today. The location where Ida was discovered is known as the Grube Messel, a World Heritage Site, and 47 million years ago, it was a para-tropical rain forest. Complete specimens are also extremely useful for scientists, to learn as much as possible about the species. This particular find is missing an arm, and is somewhat crushed, but remains the most complete primate ever discovered, which will yield an enormous amount of information on how Ida and her kind moved, what they ate and what their life cycle would likely have been. Certain changes between this and earlier fossils also helps to uncover information about the evolution of this group, and Ida seems to represent a certain amount of diversification within this group of primates. Scientists believe that this species falls at an early time in the ancestral line that would eventually lead to humans.